This SELFcare event will be brought to you by SELFCAREBELLE and Huntley Counseling Center. This SELFcare event will be first of many, you don’t want to miss out! This event will take place June 16, 2018 from 12pm-3pm at the Mallard Creek Recreation Center located at 2530 Johnston Oehler Rd. Charlotte, NC 28269. 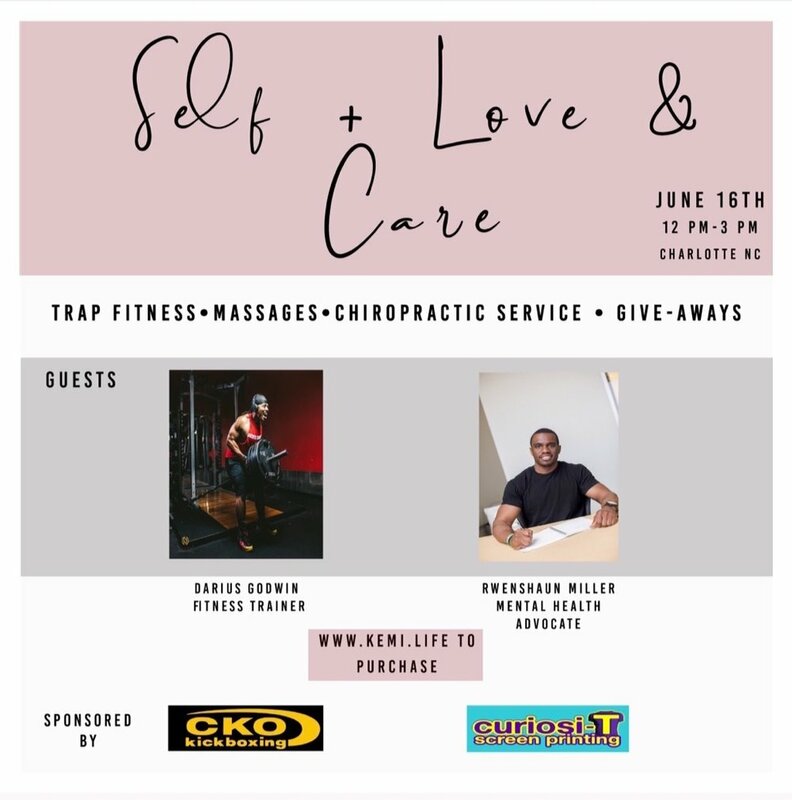 This event will be an intimate event and real event, there will be an icebreaker game, light refreshments, 1 speaker, a chiropractor, a massage therapist, giveaways and TRAP Fitness! There will be a chance to socialize and meet new people especially! You will be given an opportunity to hear from Rwenshaun Miller, a Mental Health Advocate and Therapist, who is willing to be vulnerable and speak about his experiences with mental health and how he incorporates SELFcare into his lifestyle! At the event, you will also have the option to get a quick massage by a licensed massage therapist and/or receive a quick service from a licensed chiropractor! And the highly anticipated TRAP Fitness brought to you by S.P.A.X Fitness, it will be a 45 minute group workout, but so much fun; playlist consists of TRAP music only! Of course if you don’t already have a SELFcare Tee, you will have an opportunity to obtain one at the event as well. If you are interested in becoming a sponsor for this event or future events or want to be a part of future events please email selfcaretees@gmail.com.